^ Origins. U.S. Department of Energy. [2007-07-29]. （原始内容存档于2007-07-12）. ^ The Clinton Administration. The Washington Post. 2000-02-18 [2007-07-29]. ^ Biography of James Schlesinger Origins. U.S. Department of Defense. [2007-08-13]. ^ President Hazel R. O'Leary Honored by Urban League. Fisk University. [2007-08-13]. （原始内容存档于2007-09-27）. 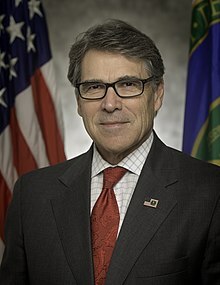 ^ Federico F. Peña to be Sworn in as the Eighth Secretary of Energy. U.S. Department of Energy. [2007-08-13]. （原始内容存档于2007-09-29）. ^ Chu named energy chief. The Straits Times. 2008-12-12 [2009-01-22]. （原始内容存档于2009-01-26）. ^ President-Elect Obama Nominates Dr. Steven Chu as Energy Secretary. U.S. Department of Energy. [2009-04-05]. （原始内容存档于2008-12-25）.